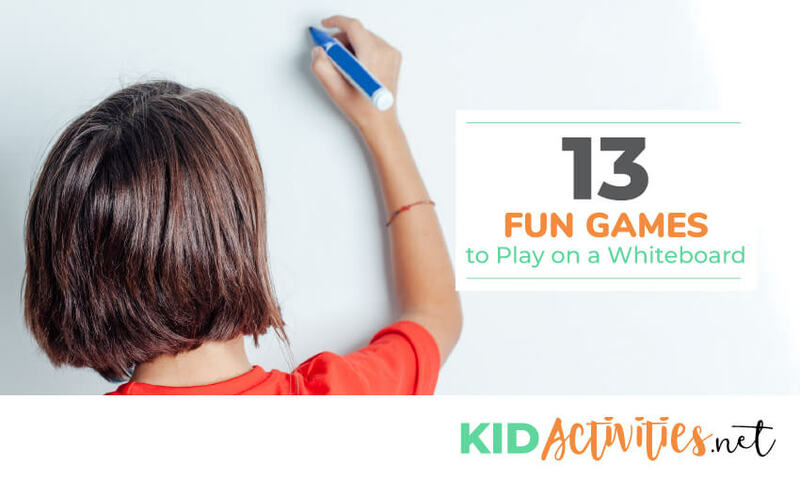 Why games to play on a whiteboard? Playing games at home with the family is a proven strategy to bring families closer together, learning, sharing while having a good time. There are several budget-friendly ways to do this; the least expensive would be utilizing a whiteboard or dry-erase board. 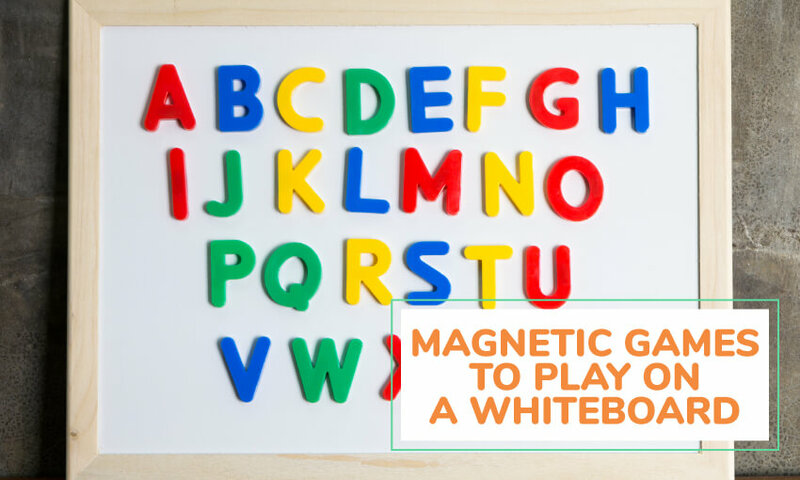 The board has a smooth surface that allows nonpermanent markings using dry erasable markers or whiteboard markers as they are known, made from non-toxic inks that can be quickly erased with a whiteboard eraser or paper towel after each game. Whiteboards come in various sizes making it easily transportable for camping trips, day outings, magnetic for refrigerators and easily hung on the wall. Numerous games for all ages are capable of being played on a whiteboard. 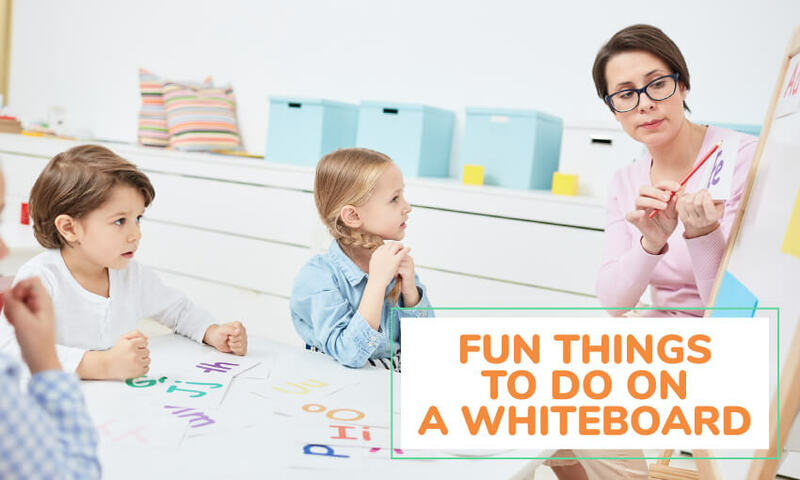 There are so many fun things to do with a whiteboard, from making a list of those ideas to playing games and more. A great team game, and just one of many fun things to do with a whiteboard, it challenges players on the opposite team to guess what is being drawn. A timer is used to make it more exciting with one minute given for each round; if no one guesses what is being drawn by the 30-second mark, the pen or marker can be passed to another team member if desired but the puzzle value or point value is then cut in half. The drawer cannot give hints and cannot speak nor can they use letters, numbers or symbols in the drawing. Should a member of the opposite team mention part of the phrase or word it is allowed to be written down on the board. If the other team guesses correctly they receive a point, and the team with the most points wins. A basic total of 10 points per round is a good place to start. The first team to earn 30 points wins. Teams usually consist of 3 players. Players can incorporate a bonus round if desired. This is a speed round with 90 seconds given for completion. The team that has the most points after the 3rd round is the team to begin the speed/bonus round. Passing the marker to another team member is allowed twice during this round, and each correct guess is worth 25 points. Phrases for the bonus round as well as words for the regular rounds are written down on index cards and given to the team by the game monitor who does not participate in the rounds but is the referee for the game. The team with the most points at the end of the bonus round wins. Phrases, Song Titles, National Monuments, and more can be used in this easy to play whiteboard version. Using the spinner from another game, parents or teacher can make triangles to fit the spinner and place them on it after designating either dollar amounts or point amounts. The referee will draw the appropriate squares on the board for each round and also write in the correct letter guessed. Make the game more fun for kids by writing a weekly chore in the bonus triangle that they will not have to do for a week if they win! Travel the world right at home with this game. Explore your hometown, a specific State or Country. A great game for one or two players and even teams to participate in, don’t forget the referee. Given clues by the referee such as the language spoken, climate, oceans surrounding it, famous landmarks exports they are known for and even its flag can all be a part of the game. As each clue is correctly guessed, the referee will draw a portion of the outline of the Country or State until the entire outline is completed. For younger children, write dashed lines for each letter of the name of the State, City or Country. The first player to correctly guess the area wins. There are variations on this competitive game. Divide the board into two with a line down the middle, one side for each team and at the top list the team name or just Team 1 and Team 2 and underline for the headers of those sections. Use spelling words, phrases, or math equations for each team to complete. For spelling words and math equations; words can be scrambled and already written on the board for members to unscramble and when finished they return to pass the marker to the next team member. Math equations can be listed on index cards that each player can receive from the referee (teacher) and take to the board to complete then return the card to the referee and give the marker to the next player who does completes the next equation given to them. Another idea for the relay is remembering phrases, each player must write down one word from the phrase and then return the marker to the next player to complete the second word and so forth until the phrase is complete. This video is an easy tutorial for teachers to use. A great game to play while traveling with a personal size whiteboard. Simply make an open grid of two lines down about an inch apart and two lines across them also one inch apart. One player will be making an O and the other will make an X in the square they choose. The player that is able to make three in a row wins. Magnetic Tic Tac Toe: As played above but with plastic letters glued to mini magnets or using 12 round magnets, paint 6 with a red X on one side and leave the other 6 leave black and paint a white O on them for players to use. Make your own flat chess pieces by drawing or printing each game piece onto a piece of paper, cut to size and glue onto magnets. Color the squares in one inch squares for a total of 64 squares and only color in every other square alternating color per row. Alternate a dark square next to a light square and then the next row begins with the color opposite the square it will be placed next to. You will need a board grid with a total of eight rows across and eight rows down for a total of 64. 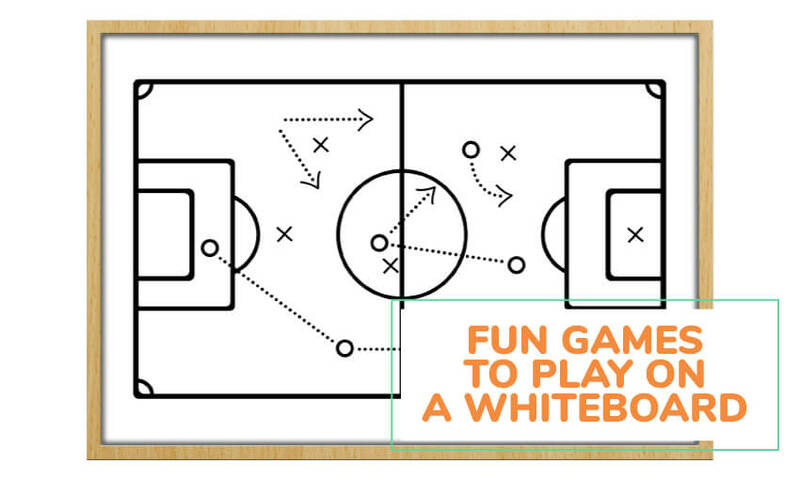 Draw your field of play and use magnets as your players to instruct your teams to victory! A wonderful travel game for children to spell out the items they see while on the road during a day trip. Using the shapes and letters from children’s game sets, parents can play with toddlers teaching both letters and colors. for games or check out Spin Zone online to purchase. A fun game for children is to learn to identify animals from around the world by playing Who’s at the Zoo. Old larger puzzle pieces that can be purchased at local thrift stores can be used, updated with non-toxic paint if needed and then have a magnet glued to the back. Toddlers can identify the animal and older children can compete in spelling out the name of the animal such as giraffe, elephant, tiger and so forth. Whiteboards can be used to list a chore chart for each child. It’s a great reminder that children can easily participate in daily and weekly by marking off the chore completed enabling a sense of accomplishment and pride in the family unit. There are numerous styles to choose from for self-sufficient kids, with a host of information making it fun for both the child and parent. Helping children to learn age-appropriate skills increases their self-pride, sense of accomplishment and with an allowance as an incentive, it also begins a good working ethic. With age-appropriate skills listed on the charts, parents can easily decide which chores should be on the list and which can wait. Since it’s a whiteboard, at the end of the week or month the list can be updated to reflect which chores may have changed or been reassigned to a different family member. As in this video, the word “cow” is used to draw a cow. Challenge your partner to draw the animal you write into that animal. This method allows creative expression, word recognition and challenges the drawer to use their imagination. A fun way to practice drawing that won’t waste paper is to use the whiteboard of course! Any mistakes can be easily erased and then drawn over until you have the perfect picture you want. Take a photo of it, erase and draw something else. This method is an easy way for artists to sketch out ideas that they can then transfer to the medium of their choice. There you have it, a list of some fun games to play on a whiteboard. Make sure you check out some of these other great posts.